In The Rockies, Climate Change Spells Trouble For Cutthroat Trout : The Two-Way Native cutthroat trout, an iconic part of the mountain West, thrive in cold streams. But warmer weather has allowed invaders to move in — and it's killing off the cutthroats. Native westslope cutthroat trout swim in the north fork of the Flathead River in northwestern Montana. However, cutthroat trout populations are threatened by hybridization from mating with rainbow trout. It's relative rarity now makes it a favorite for catch-and-release anglers. But biologists have now found that it's in danger. The much more common rainbow trout is invading cutthroat streams and mating with the native fish. Ecologist Clint Muhlfeld says that creates hybrids. "It jumbles up the genes that are linked to the locally adapted traits that these fish have evolved with," says Muhlfeld, who's with the U.S. Geological Survey and the University of Montana's Flathead Lake Biological Station. Those traits have allowed cutthroats to survive through millennia in cold northern streams. And cold streams were thought to protect them from rainbows, which prefer warmer water. But climate change is warming many high-altitude streams, and they frequently have less water, another change that favors rainbows. So they're moving in. 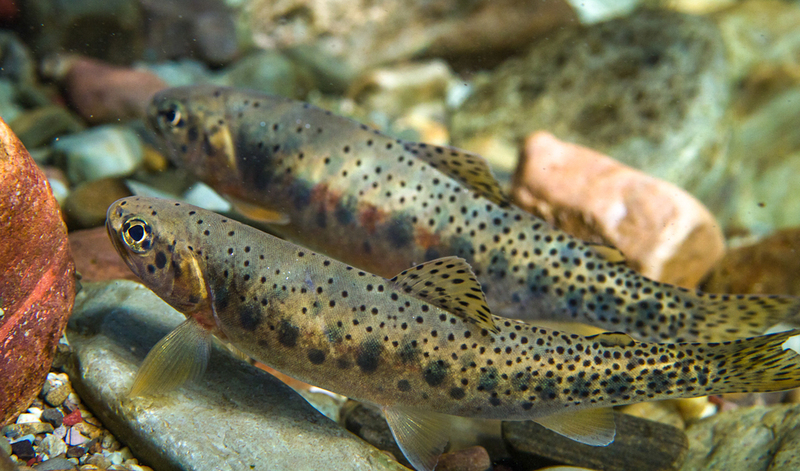 Muhlfeld says that when rainbows and cutthroats breed, the resulting hybrids are feeble — "less fit," in biological terms. "They don't survive as well as the native fish," he says. And hybrids that do survive continue to make more hybrids; there's no going back to making cutthroats again. Writing in the journal Global Change Biology, Muhlfeld and a team of scientists from several research institutions studied fish in hundreds of locations in the northern Rockies. Hybridization was widespread. It was most common in places where fish and game departments have introduced rainbow trout, a practice that goes back to the 19th century. Some states are trying to solve the problem by getting rid of rainbow trout. That might not please some anglers, but Muhlfeld says the cutthroat species could disappear otherwise. "There are so many places around the world where you can go catch a rainbow trout," he says; it's been introduced all over the world. "There's very few places where you can actually go and catch a native fish that's been around for thousands and thousands of years. "Extinction is permanent. Once the native genomes and adaptive traits are gone, they are gone forever."